McGraw-Hill Education Tab, 9780071630160, 218pp. Brian Clark Howard (New York, NY) is a Web editor at The Daily Green (www.thedailygreen.com), which is part ofHearst DigitalMedia and is one of the world's largest and most trusted sources for consumer information on living a more environmentally friendly life. Brian was previously managing editor of E/The Environmental Magazine, the oldest and largest independent environmental magazine in the United States. He has written for Yahoo!, MSN, Plenty, The Green Guide, Popular Mechanics online, Men's Health, Mother Nature Network, Oceana, AlterNet and elsewhere. Brian coauthored a book on geothermal heating and cooling, forthcoming from McGraw-Hill, and he wrote the chapter on green power and green lighting for the 2005 book Green Living (Plume), which he also coedited. 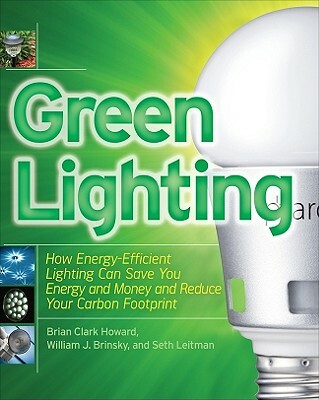 Brian also wrote the chapter on saving energy for the 2009 book Whole Green Catalog (Rodale). Brian earned an MS in journalism from Columbia University and holds two bachelor's degrees in environmental sciences. Brian was a finalist for the 2005 Reuters/IUCNEnvironmental Media Awards and has appeared on numerous radio and television programs. He also blogs for Asylum and as the URTH Guy at The Daily Green. Bill Brinsky founded Envirolite Systems which focuses on lighting and energy, from design of new systems to energy efficiency upgrades of current systems. He previously worked for Con Edison. Seth Leitman is President and Managing Member of the ETS Energy Store, LLC (www.etsenergy.com), which sells organic, natural, and sustainable products for business and home use. Previously, he worked for the New York State Power Authority and the New York State Energy Research and Development Authority, where he helped develop, market, and manage electric and hybrid vehicle programs serving New York State and the New York metropolitan area. Seth is the co-author of Build Your Own Electric Vehicle, Second Edition.